In Lech Lecha, G-d tells Avram that he will be a blessing to humanity. “…and I will bless thee, and make thy name great; and be thou a blessing.” (Genesis 12:2) With the change of one vowel, the Midrash relates, the Hebrew word for ‘blessing’ becomes ‘spring of water.’ And so, by blessing, we heal, we purify, we connect each other to G-d. For Lech Lecha 5774, I’ve replaced the metaphor of being a ‘lamp’ with being a ‘well’ of love. Ultimately, this is a prayer about living a life of service. 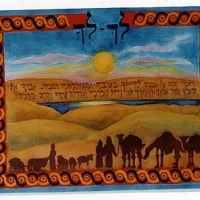 The original will appear in my forthcoming book, Jewish Prayers of Hope and Healing. So that I am present with kindness and understanding. A well, overflowing with Your love. Grant me the wisdom to offer myself willingly, without fear. © 2011 Alden Solovy and www.tobendlight.com. All rights reserved.